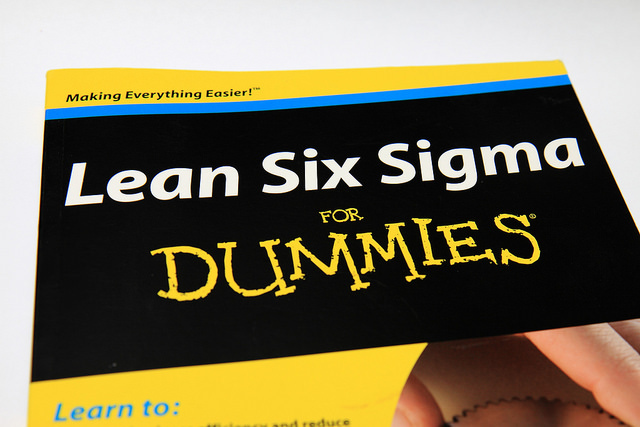 Before I answer the title question, let’s have a quick refresher on what exactly Lean and Six Sigma are. Six Sigma owes its roots to the Statistical Process Control developments made by Dr. Walter Shewhart of Bell Laboratories in the 1920’s and later expanded upon by Dr. W. Edwards Deming. The technique later evolved into the Six Sigma business strategy driven through innovations by Motorola and General Electric. Basically it is a customer-focused, data-driven methodology that identifies root causes defects due to both specific and common cause process variation. The method utilizes the industry standard DMAIC structure–define, measure, analyze, improve and control—to innovate and generate solutions to specific and systemic problems that affect the end customer of the process. Dr. Deming was always a staunch advocate of fixing the process rather than blaming the employee for the outcomes of a poor process. It is process variation that is the true enemy of a ‘great’ process. Lean, on the other hand, analyzes process flow and related outputs, including waste. Core events within a lean program are Kaizens, which are focused, high energy, cross functional design sessions whose goal is to create standardized solutions which can then be implemented in a step wise fashion. Lean is all about introducing Straight Through Processing coupled with flexibility where required across processes. Similar to Six Sigma, there is a clear focus on the customer, taking non-value added process steps out of the environment and automating process segments where possible. Combining Six Sigma and Lean has proven effective, given the fact that Six Sigma improves quality through decreased defects while Lean increases process efficiency, velocity and flexibility. Plus both methods are squarely focused on improving outcomes for the customer. The term most commonly used today is “Lean Six Sigma”. So do Lean and Six Sigma have a place in tomorrow’s supply chain? Absolutely. In today’s advanced demand-driven value networks, the data driving our measurement system is being generated in real time by both planning processes and the resulting operating transactions. This type of technology architecture allows a planner to not only see the symptoms related to a supply network issue, but also to look deeper into the root cause of the problem. In this way, the analytical process robots running continuously in the supply network can support both six sigma and lean strategies. These robots provide information to the planner’s dashboard that allows them to interact with the system, solve any critical symptoms short term, and make permanent long term fixes to root causes. Using a dashboard, planners gain full visibility and control to all current and future issues and exceptions within the processes they have permission to access. Elimination of issues related to either symptoms or root causes can be evaluated through the advanced measurement system and action taken based on the desired set of results. Issues can be resolved in different ways depending on whether the strategy at that point in time is to improve service levels, reduce inventories, increase capacity utilization or some combination of those or other variables. Thus, not only do Lean and Six Sigma have a place in tomorrow’s supply chain, in a DDVN environment they can be used to drive more value than ever before. To read more about this subject, I suggest you read the new whitepaper, Supply Chain’s New World Order”, where I also discuss the cloud, S&OP, and why a holistic approach is needed for supply chain management. Previous Post:How is outsourcing impacting IT investments in the pharma supply chain?